I have been listening to and studying the work of Paul Stamets http://bit.ly/eV9KQ0 and his “mycorestoration” process for healing habitats. Mycelium are the beings who grow in long strands through the loamy soils of our planet, the fruiting body of mycelium are mushrooms. Mr. Stamets has deeply studied mushrooms both their history and their potential for saving the planet. The video link I have provided above leads to Mr. Stamets 17 minute video for TED.tv ;Technology Education and Development. TED.tv is a brilliant resource for anyone wishing to keep up on the latest academic research on human beings who are working to improve life on the planet. Mr. Stamets talk is called “Six Ways That Mushrooms Can Save the Planet”. I urge you to watch this video. I keep it bookmarked on my computer and re-watch it when I need encouragement. 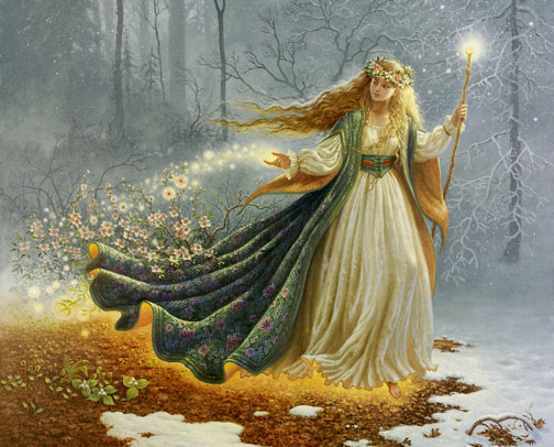 As a devout Pagan and a Wiccan Priestess my connection to non-human beings and the elemental realms is a real and palpable emotional concern. I regularly experience moments of emotional overwhelm and distress as I continue to be awake to the pain of the environmental damage our daily actions cause to the Earth herself. It gives me hope to watch this video as Mr. Stamets work is a shining example of what happens when a heart centered mystic becomes a scientist and applies his love for the earth to useful immediately applicable techniques for planetary healing. Mycorestoration are techniques that apply the strengths of mycelial natural growing processes to environmental issues that arise from the disruption human behaviors cause to natural habitats. The six areas of Mycorestoration covered in the video are beyond the scope of this particular article but include: 1) Repairing damaged watersheds, 2) Cleaning up toxic spills 3) Creating alternative fuel sources 4) Using mushroom extracts to heal from specific illnesses 5) Non-toxic pesticide 6) inoculating cardboard with mushroom spores to turn garbage into gardens. In October 2010 a long row of mushrooms grew itself in a line up the street to my front door and then made a ring around the outside of the house. Actually, I now understand that for this to be possible, the mycelium were already there and something occurred, ( the right combination of nutrients? ), that allowed the mushrooms to bloom simultaneously. In contemplating this event during meditation it occurred to me that I needed to include “mycorestoration” of the grounds in my plans for building a physical Temple in Redmond, WA on the Longhouse property. My meditation practice is a merging of Tibetan Buddhism in the Dharma Ocean lineage www.dharmaocean.org and Reclaiming Witchcraft www.reclaiming.org/ and Holistic Peer Counseling http://holisticpeersupport.com/ visualizations where I drop down into both the physical planet earth and the element of earth and listen and merge energetically. In the last four months I have come to see that helping to restore and deepen the mycelium mat in the ground is essential to manifesting a physical Temple or possibly any material thing I desire. This mycorestoration and Stamets’ belief that mycelium are the neural network of the planet (or alternately earth’s internet) has become increasingly compelling and is now guiding a lot of my magical work and social networking. One way that this is manifesting is in my recent choice to use the internet to identify and network with other Magickal practitioners who are called to re-build Temples focused on increasing the worship of the divine feminine. I have been successfully seeking other Priestesses of Love and Lust Goddesses and strengthening our connection sharing nutrients and information and restoring the underground soil embedded connection of our magicks. For the past 20 years I have been developing techniques of embodiment and magickal exercises that encourage human beings to heal from trauma and emotional distress so that they can become more present in their bodies. My thinking is that the Earth needs our attention but we can not give it because so much of our life force energy is trapped in the neurotic behaviors we have created in order to survive our past experiences. Most humans are not fully in their bodies and thus are not able to be fully present to their environments. My work in the world is to help myself and others be present in the Here and Now, (the place where Love and Empowerment actually exist), by removing as much societal programming and emotional distress as possible so that we can redirect our time and attention to the Earth. Feel free to see the classes and hands on healing services I offer through Living Love Revolution on my website: www.livingloverevolution.com I have intentionally chosen to align my own work with the Greek Goddess of Love and Lust: Aphrodite. I am personally inspired to create group experiences in her name, where people embody love and have hands on healings that generate oxytocin and seratonin naturally, thus restoring their nervous systems and helping to develop a default response of “calm and connect” instead of “Fight or flight”, (for more on this see the works of Nekole Shapiro at www.tantricbirth.com ). I have come to see my own work as part of the process of using the internet to restore connections between myself as a fruiting body of the Goddess to other fruiting Bodies. In my on line work I have been meet these mushrooms so far: Laurelei Black http://www.aphroditepriestess.com/ Joanna Freuh www.joannafrueh.com/ and Jane Meredith http://www.janemeredith.com/ezine.htm whose works I spoke of at my salon “Re-Membering Aphrodite” on Feb 1st. There are a few other events I will be attending this year that I see as a clear extension of this work. Reclaiming Witchcraft tradition holds weeklong retreats called “Witchcamps” all over the world and I have attended the Vancouver British Columbia Witchcamp for the last two years; http://www.reclaimingquarterly.org/witchcamp/bcwc/. I helped to create the current intention of BCWC 2011, by participating in the “visioning” process for this camp. The visioning occurred a few days after I saw mushrooms fruiting around my house. On the same day, a few hours after the “visioning”, I found Joanna Freuh’s book “Monster/Beauty” while browsing in a Vancouver bookstore and I met two people who are now central to my Aphrodite work. Intention of BCWC 2011: “Between earth and starry heavens we gather allies of love to help us open to love’s ability to transform all obstacles. We marry our love to acts of joyful service to the earth.” INDEED! I shared this vision of mycorestoration with Yuri Albinger of wild eating (see his wonderful videos on wild foraging here:http://design.beeitltd.com/Yuri+Albinger/ ) and he is excited to lead us in taking mushrooms from the intact forest on one side of the Longhouse property to the bulldozed areas where recent construction has destroyed the mycelium and soil. It is my intention to build a Temple that will be used for the worship of Aphrodite on this site. Our first mycorestoration trip on Thursday Feb 10th was a big success and we’ll be continuing to restore the mat periodically. Join us again on Thursday April 7th and call me to find out about future dates. Wear boots and waterproof clothes as it is a wetland. Feel free to call me 206 612-3511 or keep up with my website and blogs at www.livingloverevolution.com ,if you want to participate in any part of this ongoing adventure with Temple, Stardust, Mushrooms, Aphrodite and Earth herself! Blessings! Reverend Teri D. Ciacchi MSW Living Love Revolution.